- The suspected "mastermind" of the attacks is Abdelhamid Abaaoud, a 27-year-old Belgian from the Brussels suburb of Molenbeek. He is believed to currently be in Syria. - French Interior Minister Bernard Cazeneuve said that police conducted 168 raids Sunday night and early Monday morning, and 104 suspects were placed under house arrest. - Belgian prosecutors have confirmed that two of the seven people detained on Saturday are being held on terrorism charges. The other five — including the brother of one of the attackers — have been released. - In a historic speech to both houses of parliament at the Palace of Versailles, French President Francois Hollande said that "France is at war," and that Friday's attacks "represent an attack against our country, against its values, against its youth, and against its way of life. These acts were created by an army of jihadis who are fighting France because it is a country of freedom." The president said France would respond with "cold determination." Hollande also outlined a number of legal and security measures he will take to prevent further attacks, including implementing a three-month state of emergency and tighter border controls. He also called for a comprehensive European response to the migrant crisis emanating from the conflicts in the Middle East. - US Secretary of State John Kerry arrived in Paris on Monday to pay respects to those killed in last week's attacks, and to stress a shared resolve with a key ally in the war against Islamic State militants. - The Eiffel Tower was lit up for the first time since Friday's attacks in the national colors of red, white, and blue. - Speaking at the G20, President Barack Obama said during a news conference that he had ruled out putting American troops on the ground to fight the Islamic State, saying it "would be a mistake." Obama said the US-led coalition fighting IS would redouble efforts to implement their current strategy in the wake of the Paris attacks rather than moving in a new direction. "We are going to continue the strategy that has the best chance of working," Obama told a news conference. - A total of 21 states have said they will not let in Syrian refugees: Alabama, Arizona, Arkansas, Florida, Georgia, Illinois, Indiana, Louisiana, Massachusetts, Maine, Michigan, Mississippi, Nebraska, New Hampshire, North Carolina, Ohio, South Carolina, Texas, Tennessee, Wisconsin, and Wyoming. - A man appeared in a video claiming to represent the Islamic State and warned that countries taking part in the US-led coalition against IS would suffer the same fate as France. The speaker in the video also threatens an attack in Washington, DC. - At noon, France held a moment of silence to honor the victims of the deadliest attacks on the country in decades. VICE News' Harriet Salem reports that while much of the world has condemned the terror attacks in Paris on Friday that killed 129 people and critically injured another 99 while wounding scores of others, reactions from politicians in some countries were more skeptical than sympathetic. VICE News' Ryan Faith looks at the nuts and bolts of French President Francois Holland's declaration of war against "jihadist terrorism." Faith says that France fighting alone would have a good shot at taking Raqqa, the de-facto IS capital, but would have a hard time holding it against a sufficiently determined IS. So, he says, "Hollande will need to have something very visible and very decisive that he can order, short of invading the "caliphate" and ridding the world of its so-called government." U.S. Secretary of State John Kerry arrived in Paris on Monday to pay respects to those killed in last week's attacks in the French capital and to stress a shared resolve with a key ally in the war against Islamic State militants. Kerry arrived in Paris just three days after gunmen killed more than 130 people in attacks on bars, a concert hall and a soccer stadium in Paris. He is due to meet President Francois Hollande on Tuesday morning. - Donald Trump told CNBC that Syrian refugees were like a "Trojan horse" for Islamic terrorists to sneak into the country. "We cannot let them into this country, period," Trump said, referring to Syrians. "Our country has tremendous problems. We can't have another problem." - Texas Senator Ted Cruz said on Sunday that the US should treat refugees differently depending on their religion, saying that there was "no meaningful risk of Christians committing acts of terror," but that it would be "lunacy" to allow more Muslims into the country. - Jeb Bush said the US should carefully screen out all other refugees who were not Christian. "We should focus our efforts as it relates to the Christians that are being slaughtered," Bush told CNN's Jake Tapper. - A total of 11 Republican governors — from Louisiana, Ohio, Indiana, Arkansas, Michigan, Illinois, Mississippi, Texas, Massachusetts, and Alabama — have either signed executive orders explicitly refusing to accept Syrian refugees, or expressed reluctance about doing so in the future. - Republicans in Congress are also pushing for a vote on President Obama's plan to allow 10,000 Syrian refugees to settle in the United States, a maneuver almost certainly intended to defeat the president's plan. German police have detained an Algerian man in a refugee reception centre in connection with the attacks in Paris, officials said on Monday. He is also alleged to have spoken about a bomb. The senior public prosecutor in Arnsberg, Werner Wolff, said checks were being made into whether the allegations were credible. "There is currently an investigation into whether the man is an accomplice or a confidant," said Ralf Jaeger, Interior Minister for the state of North Rhine-Westphalia. Jaeger added that there was no solid evidence at the moment that the attackers in Paris had a connection to North Rhine-Westphalia (NRW). "There is also no concrete evidence that attacks are planned in NRW or the (German) federal republic," he said, adding that the situation was nonetheless "very serious". The authorities had their eyes on some Salafi Islamists and German jihadists who had been in Syria and Iraq, said Jaeger. "Fifty who have returned are known," he added. In Friday evening's coordinated suicide bombings and shootings in Paris, 129 people were killed. The Eiffel Tower has been lit up for the first time since Friday's attacks in the national colors of red, white, and blue. The landmark — which usually receives between 15,000 and 20,000 visitors a day — went dark over the weekend as a mark of respect to the 129 victims. US President Barack Obama has ruled out putting American troops on the ground to fight the Islamic State (IS), saying it "would be a mistake." Obama, speaking after a G20 leaders' summit in Turkey, said the US-led coalition fighting IS would redouble efforts to implement their current strategy in the wake of the Paris attacks rather than moving in a new direction. "This is not a traditional military opponent. We can retake territory and as long as we keep our troops there we can hold it. But that does not solve the underlying problem of eliminating the dynamics that are producing these kinds of violent, extremist groups," he added. Obama added that intelligence agencies have been concerned about a potential attack on the West for over a year but they did not pick up specific threats about an attack on Paris that would have enabled officials to stop the assault. French President Francois Hollande arrived at the Palace of Versailles to make a speech addressing an extraordinary session of the houses of both parliament and congress. This is only the second time this has happened, and so marks a highly symbolic event. Security has been extremely tight. "France is at war," Hollande began. "[Friday's attacks] represent an attack against our country, against its values, against its youth, and against its way of life. These acts were created by an army of jihadis who are fighting France because it is a country of freedom." The president said France would respond with "cold determination." "Our democracy has overcome even worse adversaries than these cowardly assassins," he said. "The French people are ardent, valiant people. Courageous people." "By deliberately attacking innocents they have shown how cowardly they are, shooting people who are unarmed… We're at war against jihadist terrorism that threatens the whole of the world and not just France." He continued: "We are fully aware of the fact that it will take time and it will require patience… The enemy uses the most vile methods to kill but they cannot get away with it… They are not out of our reach." Hollande also paid tribute to the emergency services, particularly the health system and law enforcement organizations. "France likes love, loves life, sport, culture… The assassins wanted to kill the young people of France in all their diversity. Most of those who died were under 30." On the Islamic State (IS), Hollande noted: "The attacks were planned in Syria, organized in Belgium, and carried out here." "We are facing an organization with a territorial base, financial resources, and military capabilities." Hollande said he had asked the UN Security Council to convene as soon as possible to release a joint resolution the need to destroy IS. The French president also said he had ordered 10 French fighter bombers to target Raqqa over the weekend, and received reports that they had hit a command post and a training camp. French airstrikes would continue, he said, adding that the Charles de Gaulle aircraft carrier was due to set sail to the Middle East on Thursday. Hollande also mentioned that French forces were involved in supporting attacks against Boko Haram in Nigeria and jihadists in Mali. "Syria has become the biggest manufacturer of terrorists in the world," and criticized the international community's lack of cohesion in their military response against IS. He then said that France wants rapid implementation of "coordinated and systematic controls" of the European Union's internal and external borders. He spoke of the importance of controls at borders, particularly in regards to the movement of arms, and said if the EU's external borders weren't properly guarded it would lead to the "deconstruction of the EU." He said those with dual citizenship should be prevented from returning if they constitute a terrorism risk, unless they agree to undergo strict surveillance, and that those who are condemned from it should be stripped of their French citizenship. He also said that 5,000 policing jobs will be created in the next two years, and that France's defense forces will not be reduced in size until at least 2019. Hollande also asked MPs to vote to change the constitution so the state of emergency could continue for three months in order to fight "terrorism." And that security measures will increase France's military spending but that is more important than EU budget limits. The president said France's regional elections would take place as planned next month. Hollande concluded with: "Long live the republic. Long live France," and was met with a standing ovation. The assembled politicians then sang the national anthem together. Belgian prosecutors have confirmed that two of the seven people detained on Saturday are being held on terrorism charges. The other five — including the brother of one of the attackers — have been released. AFP is reporting that German authorities have also arrested an Algerian asylum seeker. The man reportedly told other asylum seekers early last week to expect bombs to go off in Paris, according to senior prosecutor Werner Wolff. The raid in Molenbeek in Brussels appears to have come to an end, with Belgian public broadcaster RTBF reporting that — while one person was detained — it was not suspect Salah Abdeslam. Molenbeek mayor Francoise Schepmans also confirmed that the raid has now finished. 7:32am ET (1:32pm local time): Police Operations Are Continuing in Brussels Suburb. Reports of at least two bangs — possibly controlled explosions — have been coming from Molenbeek in Brussels, where a raid is still ongoing. Journalists have been asked by the police not to broadcast live from the scene. 7:21am ET (1:21pm local time): Islamic State Threatens Attack on Washington D.C.
Islamic State (IS) militants have apparently today released a new propaganda video warning countries taking part in airstrikes against Syria and saying they will suffer the same fate as France. A speaker in the video also threatens an attack in Washington D.C.
"We say to the states that take part in the crusader campaign that, by God, you will have a day God willing, like France's and by God, as we struck France in the centre of its abode in Paris, then we swear that we will strike America at its center in Washington," the militant said. 6:23am ET (12:23pm local time): There's Disagreement on Whether Salah Abdeslam Has Been Arrested. Conflicting reports are circulating as to whether suspect Salah Abdeslam has been caught by police in the Brussels suburb of Molenbeek, where a police raid is ongoing. Belgian broadcaster RTL said he had been arrested, but prosecutors then told journalists that these reports were false. Salah's brother Ibrahim Abdeslam, 31, has been named as one of the suicide bombers who was involved in the attack on the Comptoir Voltaire cafe on Friday. France held a moment of silence to honor the victims of the deadliest attacks on the country in decades. 5:50am ET (11:50am local time): The "Mastermind" of the Attacks Is Currently in Syria. There's more on the man named as having an involvement in the organization of the attacks — Abdelhamid Abaaoud. Abaaoud is a 27-year-old from the Brussels' suburb of Molenbeek and is believed to currently be in Syria. A source close to the French investigation told Reuters: "He appears to be the brains behind several planned attacks in Europe." 5:45am ET (11:45am local time): Turkey Says It Warned France About One of the Alleged Suicide Bombers. Turkey notified France twice, in December 2014 and June 2015, about one of the attackers in Friday's suicide bombings and shootings in Paris that killed 129 people, a senior Turkish government official said on Monday. Mostefai, 29, is from Chartres, southwest of Paris. He was identified by the print from one of his fingers that was severed when his suicide vest exploded. Turkey said they received an information request from France on October 10, 2014, regarding four terror suspects but during its investigation identified a fifth individual — Mostefai. 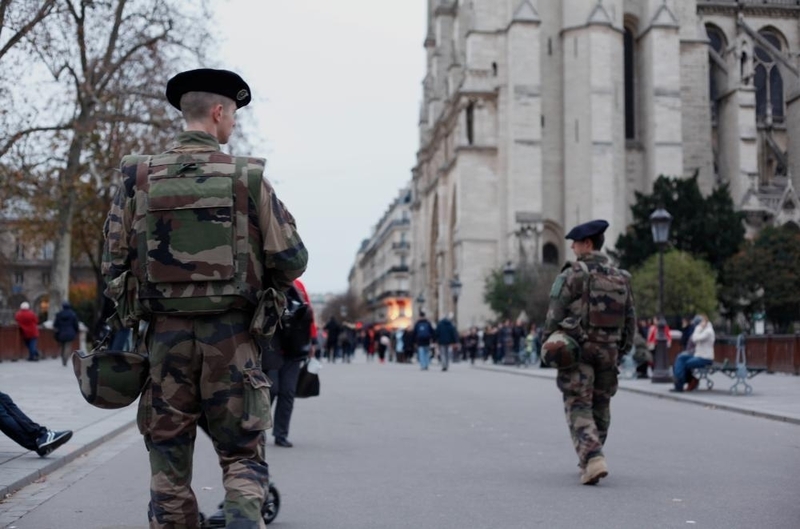 It twice notified France of its findings but only heard back after Friday's attacks. "This is not a time to play the blame game, but we are compelled to share (this) information to shed light on (Mostefai's) travel history," the official said. "(His) case clearly establishes that intelligence sharing and effective communication are crucial to counter-terrorism efforts," the official said. Reports say a police raid is currently happening in Molenbeek in Belgium's northwest. The Brussels suburb is believed to have produced a large number of jihadi foreign fighters who have left to fight in Syria and Iraq. French Interior Minister Bernard Cazeneuve has said that police conducted 168 raids overnight and 104 people have now been placed under house arrest. A French official has named the suspected Belgian "mastermind" of the attacks as Abdelhamid Abaaoud. The official — who did not want to be named because he was not supposed to speak to the media — told the Associated Press that Abaaoud is believed to have links to other failed attacks targeting a train and in a church in Paris. 4:30am ET (10:30am local time): Two More Suicide Bombers Have Been Named. French prosecutors have named two attackers as Ahmad Al Mohammad and Samy Amimour. If the passport found beside him at the scene of the attacks was genuine, Al Mohammad came from Idlib, Syria. He was one of those who blew himself up at the Stade de France. According to the document, Al Mohammad was 25 and born on September 10, 1990. Greek officials say the passport holder arrived in Europe in October, traveling through the Greek island of Leros. Amimour was French, from the Paris suburb of Drancy, and was born on October 15, 1987. He was one of Bataclan theatre attackers. He was born on 15 October 1987 in Paris and also lived in Drancy. French antiterrorism police units reportedly conducted coordinated raids all over the country overnight, including in a Paris suburb. According to French news channel iTele, at least three people were arrested in an operation involving about 200 officers. Among the areas reportedly raided were Bobigny, a suburb of Paris; Calais, on the English Channel; Grenoble, a city in the southeast; and Toulouse, about 100 miles from the Spanish border. A photo taken in Toulouse appears to show several police vans traveling in a convoy.